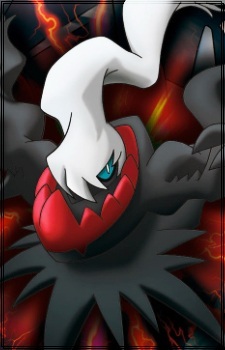 Darkrai is a black, shadow-like creature. It has a small head with a white fog-like ghostly substance billowing from its head covering one of its bright blue eyes, and also has a red spiky growth around its neck. It has skinny arms and long black tatters hanging from its shoulders, similar to the tail of Raichu. It also has black, claw-like hands. It has the slight appearance of an hourglass figure and appears to be wearing an old, ripped cloak. It normally doesn't have any sort of legs, but it is able to extend stilt-like appendages in their place. In self-defense, Darkrai also appears capable of retracting its head and white "plume" into the pit atop its torso fringed by the aforementioned red growth.